For our first article, we’re focusing on Flooring and the different types and brands of flooring here at Maison Interiors. Wood Flooring has been a favourite of the British Homeowner. Its lasting good looks coupled with easy maintenance and compatibility to support changing tastes in interior design has made both solid wood and laminates an extremely popular choice. At Maison Interiors we stock all the leading wood flooring brands including; Kahrs, Tedd Todd and many others. Laminate flooring is once again a popular choice, with its good looks, warm feel & ease of maintenance. There are a plethora of different styles to choose from including wood, tile & metal effects, all of which come with slip resistant surfaces. We have a large selection available in our showrooms including brands- Amtico and Karndean. 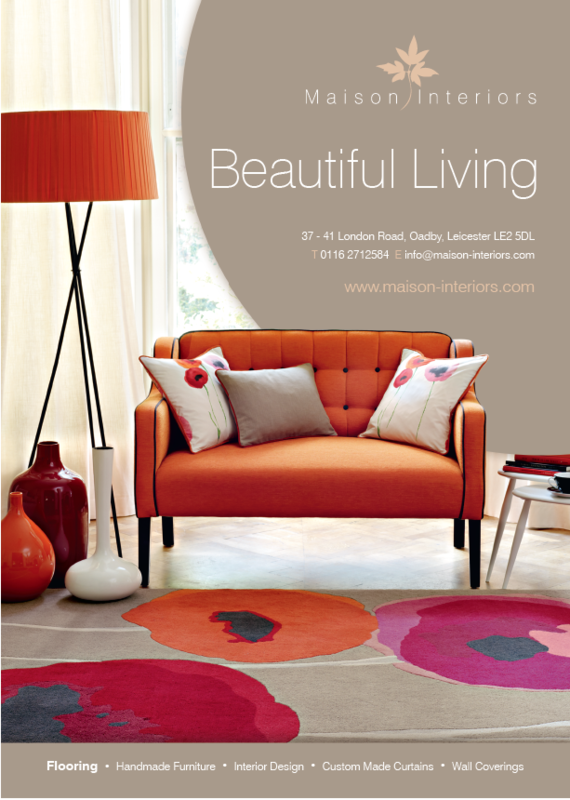 At Maison Interiors we understand that choosing the right rug for you is a difficult proposition, however we will help you every step of the way to find that perfect rug for your home, whether that’s a cool & contemporary piece or something more traditional. There is also the opportunity to ‘Create Your Own’ rug where you can design your own bespoke rug with any style, colour or size. Which means you create your own ‘Beautiful Living’. Carpets are another incredibly difficult piece of flooring to get right. Not only does your carpet have to look good but it has to be able to stand up to everyday wear & tear. A visit to our Leicester and Oadby carpet showrooms will reveal over 300 ranges of quality carpet in a variety of colours & designs. With samples carpet available for you take away. If you require a specific shade to match a fabric or wallpaper, bring them into the showroom and we can dye a carpet to match! For some inspiration why not check out our recent advert for an idea of what a quality flooring option available from Maison Interiors looks like. Or visit us at our luxury showroom where one of our expert team will guide you towards choosing the right flooring for you. Or any other interior design questions you may have.